Pippin is a WordPress plugin developer from Hutchinson, KS. 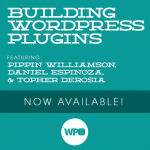 He’s been working with WP for over 5 years and has written more than 50 plugins. Pippin also serves as a member of the WordPress.org plugin review team. You might also know him from his ecommerce plugin, Easy Digital Downloads.